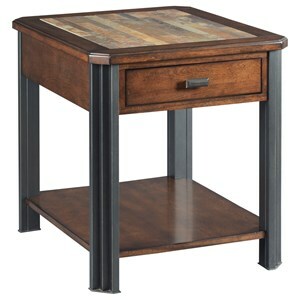 This Rectangular Cocktail Table brings together rustic, industrial and contemporary styling to create a stylish centerpiece for your living space. 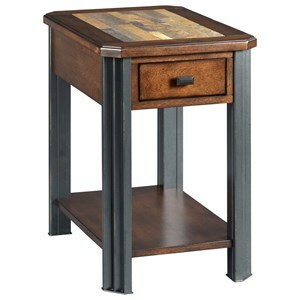 The piece features a gorgeous warm mocha finish that pairs beautifully with the burnished gray metal legs. Furthermore, the slate top boasts a random assortment of natural colors to keep the visual interest alive. As storage goes, you receive two drawers to help you rid your living space of clutter, while the fixed bottom shelf provides convenient display area. 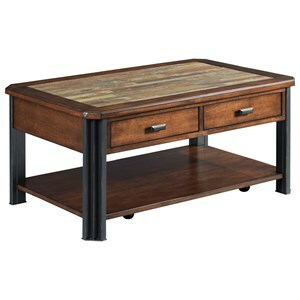 Finally, use the removable casters to reconfigure your living room whenever and however you see fit. 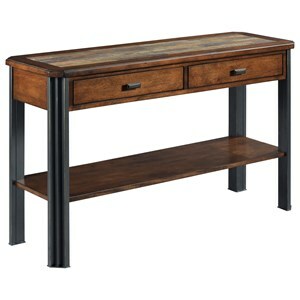 The Slaton Rustic-Industrial 2 Drawer Cocktail Table at Morris Home in the Dayton, Cincinnati, Columbus, Ohio, Northern Kentucky area. Product availability may vary. Contact us for the most current availability on this product. Need a refreshing update to your home decor? 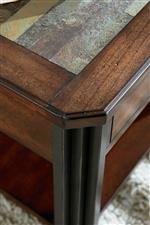 Check out this beautifully designed collection of occasional tables. Each piece finds a perfect mixture of contemporary, industrial and rustic designs to create an in-demand aesthetic. Multi-colored slate tops, metal legs and a warm mocha finish all contribute to create a collection suited for any and every home. The Slaton collection is a great option if you are looking for Rustic Industrial Contemporary furniture in the Dayton, Cincinnati, Columbus, Ohio, Northern Kentucky area. Browse other items in the Slaton collection from Morris Home in the Dayton, Cincinnati, Columbus, Ohio, Northern Kentucky area.